Preparation: Preheat the oven to 60°C, warm 2 platters and plates. Combine the wasabi with a little cream in a bowl, mix well. Pour in the remaining cream, add the lime zest, season with soy sauce. Cover the wasabi mixture and refrigerate. Heat the oil in a non-stick frying pan. Stir fry the vegetables for approx. 5 mins. Add the ginger, cook briefly, season with soy sauce, cover and leave to infuse for approx. 3 mins. Keep the vegetables warm on a plate. Wipe out the pan with paper towels. Heat the oil in the same pan. Add the fish and fry all over for approx. 1 min. Remove the fish, drizzle with soy sauce, cover and keep warm. Whisk the wasabi mixture until frothy and heat in the same frying pan, stirring constantly. To serve, plate up the vegetables and fish, and drizzle with the wasabi foam. 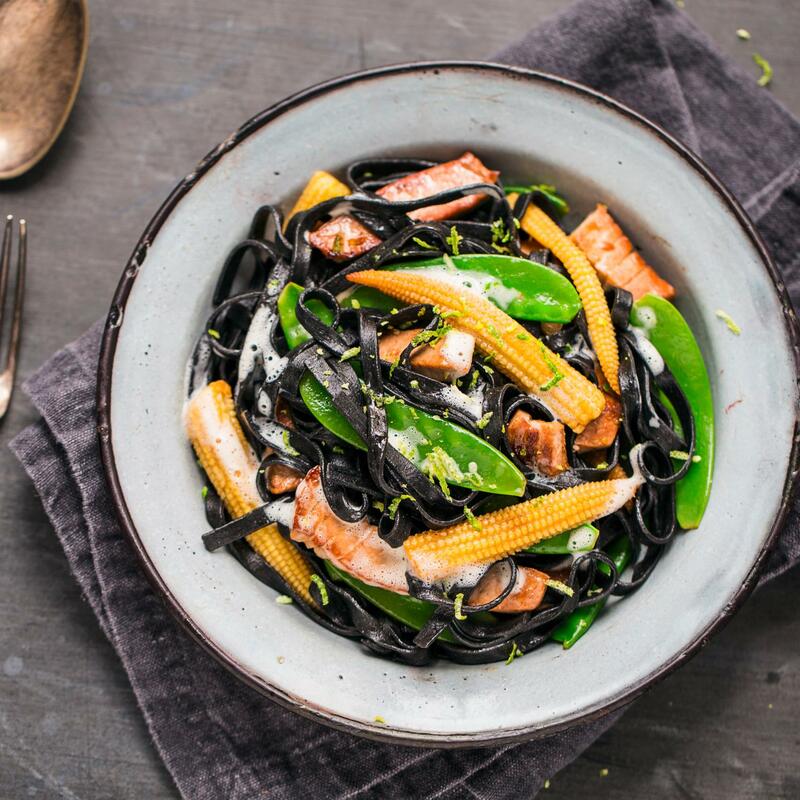 Black noodles (Coop Fine Food).